I think Buzzy's is terribly underrated. They offer a vast menu and it's all reasonably priced, and for your usual local pizza joint, the food was on par with expectations! I've never had a reason to complain, and their prices are lower than most other places in town. Oh, and the mac n' cheese slice at $3 even is possible the best drunk food ever conceived (much better than NYPD's and J&J's take on it). This place is great! The Mac and Cheese pizza sounded like the grossest thing around, but turned out to be AMAZING!!! And they have great other appitizers too! But you better get there early befre the bar go-ers get there!! Also one time on a holiday ( a drinking holiday) they had run out of dough by 11pm.... not good. but i always talk about the mac and cheese pizza!! It is fine. I'm not too impressed by most of the late night bar food type places. If you are drunk they might taste amazing but if you ever eaten it sober it just doesn't do it for you. And, when dressed in a remarkably awesome TMNT costume with music and the whole gang, they did not give us free pizza. Buzzy's is awesome! Best pizza on Water St. for sure. 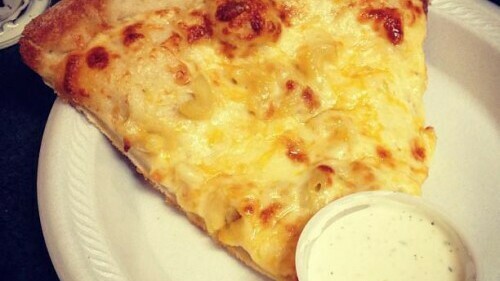 You have to try the Mac'n'Cheese pizza. Sounds weird, but its really good. It's the best after a night of drinking (they're open really late), but I've had it sober before and I still love it. I ordered food from them and an hour later I still didn't have my pizza. So I called them and asked and the person was extremely rude to me. I ended up getting the pizza about twenty minutes later after I called and I was so pissed I didn't tip the delivery man (which I sorta felt bad for, but the other worker was so rude and it was an hour and twenty minutes later that I finally got my food). I definetly would not order from them again. Also, their food is really, really cheesy.